"Live" host Jimmy Kimmel took a few jabs at Donald Trump Tuesday night after the president announced the U.S. would be withdrawing from the Iran nuclear deal. "He is so pleased with himself, pulling out of [Barack] Obama's deal," Kimmel said. "The one time Trump should have pulled out, we ended up with Donald Jr.
"But when he makes promises he keeps them. Ask any of the women Michael Cohen paid off." (Evan Vucci/AP) President Donald Trump shows a signed Presidential Memorandum after delivering a statement on the Iran nuclear deal from the Diplomatic Reception Room of the White House, May 8, 2018, in Washington. 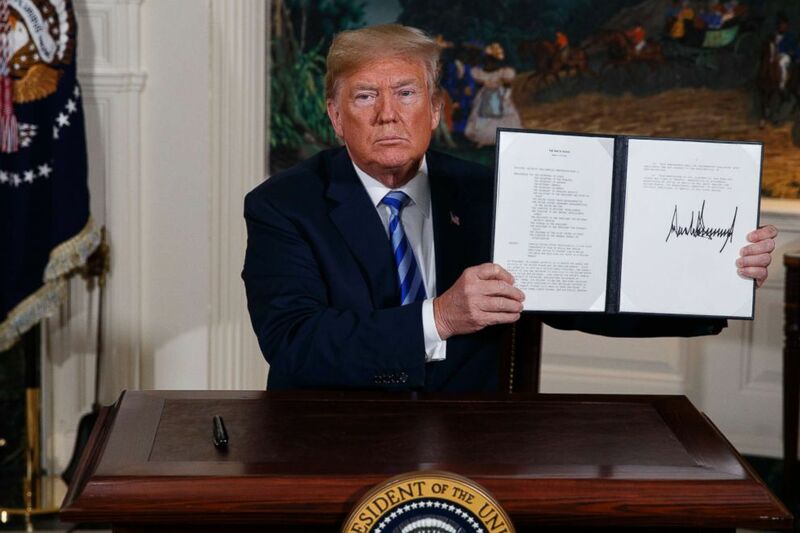 Trump announced his decision to withdraw the U.S. from the "horrible" Iran deal Tuesday afternoon -- against the advice of many of America's allies -- saying the deal was "defective at its core." "Trump said that the Iran deal was a horrible one-sided deal that never should have been made," Kimmel said. "I bet he hasn’t read one word of that deal -- he knows none of the details."